This camouflaged creature attacks prey with a tongue lash attack. Block it to dizzy the lizard, then strike back. You can nullify its camouflage with a solid hit. TIP: Light-based attacks like its glare will zap your radar, disabling the map. 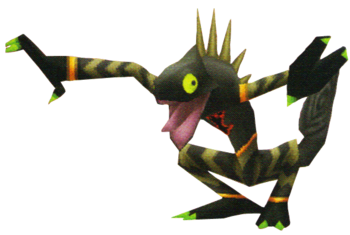 The Veil Lizard is an Emblem Heartless that is found in Kingdom Hearts 358/2 Days. It is a boss fought at the Old Mansion in Twilight Town. Xion is sent to hunt down the Veil Lizard after Roxas awakens from his coma. However, because she lost the ability to summon a Keyblade at the same time, Xion is left to only use magic. As a result, she chases the Heartless around Twilight Town. A day later, Axel and Roxas are sent to find her and destroy the Heartless. The Veil Lizard is a large, bipedal lizard resembling a chameleon. It has a dark green body, with five tan spikes along its back. It often stands hunched over, holding its arms out in front of it. Its arms and legs sport zig-zagging stripes that alternate from tan to a dark green, with gold bands at the shoulder, wrist, hip, and ankle. Its green hands and feet have three toes each, two in front and one in back, with light green claws. Its prehensile tail is curled up behind it in a spiral. It has a smooth jawline, a pink tongue that can extend to surprising lengths, and large yellow eyes with small black pupils. Its Heartless emblem is on its chest. The Veil Lizard's name, powers, and appearance may be a reference to real-world veiled chameleons. It is one of the few Heartless to actually roar. Laser Eyes: shoots lasers from its eyes, disabling the map. Tongue Lash: Uses its tongue to pull Roxas in, then slashes him with its claws. While the Stealth Sneak and Sneak Army begin their battles invisible, the Veil Lizard does not. Instead, it repeatedly vanishes throughout the fight. At the start of the first match, immediately Lock-On. Use caution as the Boss will knock Roxas away with a swing of its tail. It will turn invisible from time to time, so continue swinging the Keyblade, and it will reappear. When it disappears, Roxas can look on the map to see where to find it. As its HP diminishes, the Veil Lizard's eyes will glow. Be careful of the lasers it fires from its eyes. After a few more attacks, a cutscene interrupts the battle, starting the second phase of the fight. At the start of the second phase, the Veil Lizard is back to full health. From this point forward, the Heartless will use its long tongue and claws to deal damage. It will continue to turn invisible, making it difficult to land an attack. Lasers are also still fired from its eyes. Any other attacks it uses in this match are the same as in the first phase, so simply dodge them. Bring as many healing items as possible into this battle. Be sure to use the Limit Break, and also equip the Fire spell for when Roxas needs to put some distance between himself and the Veil Lizard. Axel will aid Roxas in this fight, but the Veil Lizard's special ability does cause some of Roxas's attacks to miss.